Strut Channels | BETTER SCREW CO.
Made of galvanized steel or stainless steel materials. Size: 1 5/8"x1 5/8", 1 5/8"x1 3/8", 1 5/8"x1", 1 5/8"x13/16" with 12Ga or 14Ga thickness. Slot size: 9/16"x1-1/8", hole spacing: 2". Can be easily cut into 10ft or 20ft lengths using a common hacksaw. 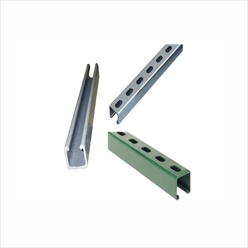 Wide range of profiles (plain or slotted) available for light, medium or heavy duty applications. Strut Channel recommended for individual fastening or for efficiently constructing pipe or tube routes.